Lawn clippings from mowing are an excellent source of high-quality nutrients which can be recycled back into the lawn to once again feed the turf naturally. Lawn clippings are naturally high in many essential nutrients, especially Nitrogen which lawns will most favour above all other nutrients. The problem with many organic fertiliser options is that they are often low in major nutrients which lawns require, and which Nitrogen is most often the lowest in these products. This is why some lawns may not get all the nutrients they require from organic fertilisers alone. The best thing about recycling lawn clipping back into the lawn is that they are highest in the exact same nutrient that many organic fertilisers are lacking, which is Nitrogen, and this brings a wonderful balance to our organic lawns. So by combining organic lawn fertilisers with recycling lawn clippings into the grass, we can create a very healthy balance of nutrients and feeding for the organic lawn without missing out on the essential Nitrogen. Recycling lawn clippings back into the turf simply involves leaving the lawn clippings on the lawn after lawn mowing. However, to gain the greatest benefit, at the greatest speed, and without running the risk of damaging the lawn, we need to keep a couple of points in mind when we do this. The clippings need to be as small as possible after mowing. This is achieved through regular lawn mowing which ensures the clippings are only very small and fine, and therefore quickly break down and deteriorate and don’t add to the thatch layer. 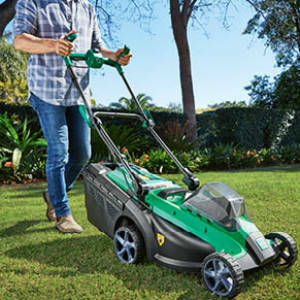 The next best thing to do is to use a mulching lawn mower, which is a standard 4-blade rotary lawn mower that has an attachment which can be added to the rear chute area of the mower. The purpose of this Mulching Plug is to send the grass clippings back through the blades which chops them up into even smaller pieces. The other great point about mulching lawn mowers and the fine clippings they produce is that the tiny clippings often disappear from the lawn surface within a couple of days of mowing the lawn. Longer grass clippings should never be left on the lawn. They will only ever break down very slowly, and will often just sit on the lawn for a very long time without barely breaking down at all. Many of these longer grass clippings will also sink into the thatch layer of the lawn. This creates more sponginess in the lawn but can also create several new problems. A thatch layer which is filled with clippings from long grass will stop water from freely flowing into the lawn soil, thus depriving the lawn roots of water, so more water may need to be applied to the lawn, which is very wasteful. A lawn thatch layer which is full of old grass clippings is just like a sponge sitting inside a lawn. As the sponge fills up with and holds onto water for long periods of time, this also creates the perfect breeding grounds for a massive outbreak of lawn diseases. And finally, a thatch layer filled with long grass clippings will require far more frequent lawn de-thatching, which can be expensive, is not environmentally friendly if avoidable, and is often avoidable by good lawn care practices. If you’ve got a faster growing lawn type and don’t want to be mowing so frequently in order to keep the clippings as short as possible, then a balance may need to be reached between catching and mulching the lawn clippings back into the lawn. In these cases, the best option may be to leave the lawn to reach a height that you are comfortable with (but not too long), and then to only recycle the lawn clippings at every second or third lawn mowing and catch the clippings for the compost pile at all other mowings. This way, the lawn receives the benefits of the Nitrogen and nutrients from the clippings, but also has a little while longer to breakdown the clippings in-between mulching lawn mowings. If you’ve recently applied any type of lawn pesticides, fungicides or herbicides, then do not recycle grass clippings for at least three more mowings after applying these products to the lawn – also do not add these clippings to the compost pile either – they must be placed in the rubbish bin.